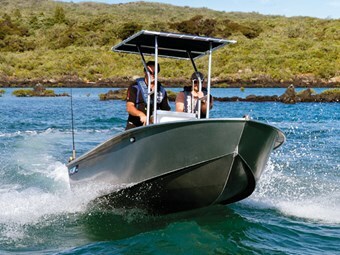 Small she may be, but this won’t stop Fish City’s resolute FC430 Centre Console from taking you out in the rough whenever the urge to fish takes hold. Conditions weren't great. A 20-knot nor'easterly pushed half a metre of chop against the outgoing tide. We were motoring straight into the weather in what is, on the face of it, a 14-foot dinghy. Craig Archer, Fish City sales manager and experienced boat racer, was unimpressed despite the bright blue sky and its photographic potential - he didn't reckon the sloppy sea was any good for a magazine photo shoot in this boat. But he was wrong: what better way to prove a boat is ready for serious fishing? What better way to show a small, affordable tinnie designed for a quick fish can head out in the rough? What better way to demonstrate there's more than one way for boat designers to achieve stability in a soft-riding boat? The sea was confused and ugly as we motored out. The FC430's smooth, gull-wing hull slipped through the errant waves as if it were a bigger boat, and Archer leaned on the throttle to show me what it could do. "Remember this is a four-metre boat," he reminded me. I nodded, noting first how dry I was despite the fact I was standing in a small centre console as the ocean churned around us. We passed 17 knots, not bad in these conditions, the ride softer and more stable than I expected thanks to the wide chines and gull-wing hull. The boat's four-millimetre hull (three-millimetre sides) was solid and the unfriendly seas weren't much of an issue for her. I asked Archer how fast she'd go with the 40hp Mercury two-stroke on the back, and he promptly turned side on to the waves to demonstrate, racing smoothly and satisfyingly down a trough at 26 knots before buttoning off slightly and turning hard to starboard to head back into the white caps. The little boat handled the demands like it was born to it - which, in essence, it was - and before long we were following the wake of our FC600 photo boat away from dry land. I'm not trying to suggest it soaked up the chop like we were on glass, simply that this great four-metre boat can easily handle a moody, moderate sea. I felt in control behind the wheel at all times, even when hitting the waves at an odd angle and crossing the 600's wake. No seats meant my only option was to stand at the helm and, even though we were pushing it, I was thoroughly impressed by the stability and soft ride of the boat at 22 knots. Because it's not about the size of the dog in the fight but the size of the fight in the dog, as they say, and this little battler has plenty of attitude to make up for its diminutive stature — I'd be confident heading out to sea when the water is no millpond. 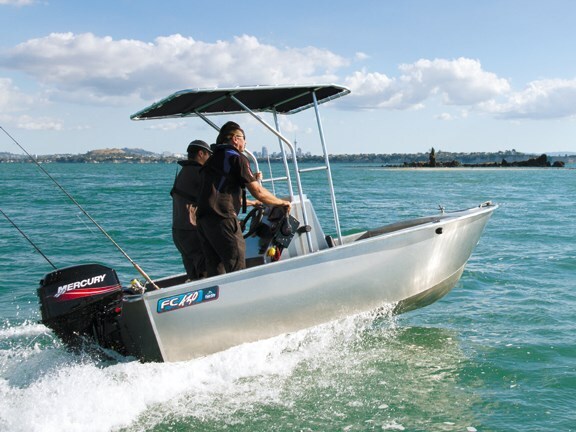 Based on the incredibly popular FC430 tiller, this is a boat designed to get fishermen out on the water quickly, easily and inexpensively whenever the opportunity (or permission) should arise. The centre console is a new development on this hull, and allows the skipper to stand and read the water while sheltered from the sun and vertical rain. It doesn't really take up any actual fishing space, you simply move around it to change sides when fishing, and because of the boat's 2.02m beam there's still plenty of cockpit space. Like all Fish City boats, it's been designed by fishermen for fishermen — the guys start by thinking of what's ideal in each application and then set about making it happen. 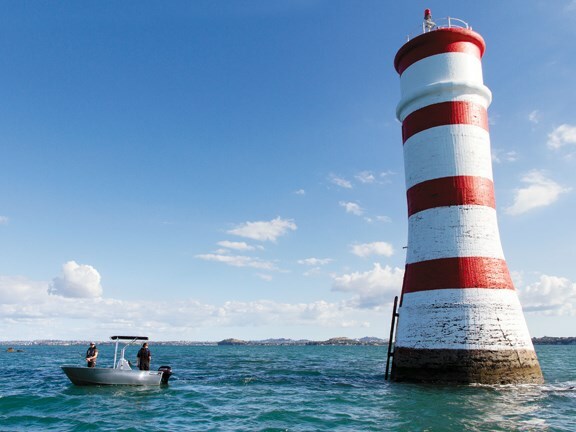 In this case it's all about producing a dedicated fishing platform that's easy to launch, retrieve and handle on your own, even when the sea's a bit grumpy. They're not as concerned about producing and selling them in volume as they are about getting the boats right and making sure their customers leave the shop with exactly the craft that's suited to them, and this one will suit anyone after a dinghy that's not a dinghy. It won't break the bank, either. A standard turn-key package (including anchor kit, full tank of gas, tie downs, registration and warrant) is just $22,995. On our test boat Fish City has added a targa top, upgraded the five-inch sounder to a Lowrance HDS7 fishfinder/GPS, and upgraded the gauges — all for $25,300. 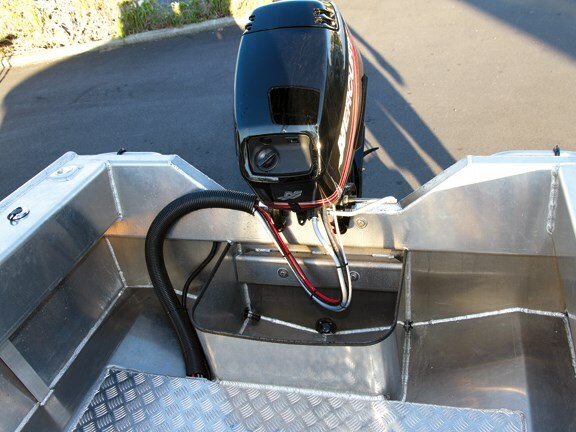 There's a generous welded aluminium live-bait tank (as standard) inboard of the transom, just another sign this is a no-nonsense fishing machine. The sides are fairly high and there's plenty of freeboard to keep the tide out, meaning you feel safely encapsulated. The gunwales are supportive for anglers when the bite comes on and there's plenty of room to move, as the cockpit, which is pretty much the whole boat, is spacious enough to fish six. There's dry storage in the bow and under the centre console, three rod holders in both gunwales, and the anchor is easy to reach. Eventually we found more sheltered waters and spent a bit of time playing for the camera. Archer threw the boat around with some hard turns at high speed, and while there was a bit of cavitation, this is not the sort of thing you'd do on a quiet Sunday fish. 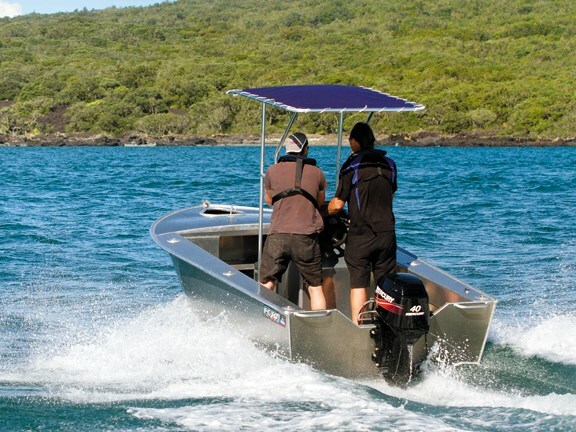 Hole-shot performance is not something you normally consider when looking for a dinghy but if you need to turn and run, the FC430 will get you up on the plane and heading home before the mutton birds know you're moving. We stopped for a quick fish, deliberately finding a spot in the angry chop to see how she coped. Again I was surprised at how she soaked up the rolling water, even when there were three of us (280kg) on one side for a while. On the way back to the ramp I found the 430 travels well in a following sea — the transom is higher than many other tinnies and, while you might not be out looking for marlin, backing down on the big ones isn't out of the question if you get lucky. I didn't start out looking for faults in this boat, and was open-minded about what I would find when climbing on board. I couldn't uncover any problems. If I had to find something to moan about it would be the fact the struts on the optional targa top could be a fraction sturdier, as they will provide occupants with something to hang on to, particularly when standing next to the skipper. It's certainly not a big deal, and finding one minor flaw is testament to the fact this boat is well built, sturdy and more than fit for purpose. Even the trailer is exceptional — the Voyager Low-Rider was specially designed for Fish City to make its smaller boats easy to launch and retrieve in shallow water, and after I (badly) backed it down the ramp for Craig to drive on, I saw how ridiculously easy it is to deal with on your own. If you take only one thing from this boat test, let it be this: this little boat behaves like a much bigger craft — it doesn't pound against the chop and is impressively stable. The wide chines help to provide lift and stability and turn the water away nicely to achieve a soft, dry ride. In short, this is a little boat with big fight. For more information phone Fish City (09) 476 4282 or (07) 846 6675 or visit fishcity.co.nz.